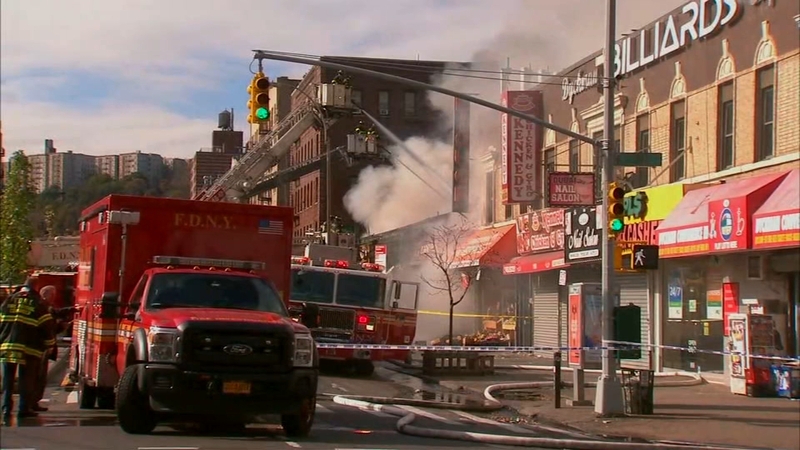 INWOOD, Manhattan (WABC) -- Authorities say the fire that destroyed stores and injured multiple firefighters in Upper Manhattan Sunday was accidental. According to FDNY Fire Marshals, the 4-alarm fire on Nagle Avenue in Inwood was caused by sparks from an operating saw blade. The fire broke out at about 10 a.m., and spread through seven stores along the street. FDNY Chief James Hodgens says the department used special two-tower ladders to put the fire out. About 140 firefighters were called to the scene. Six firefighters suffered minor injuries. The stores were unoccupied at the time of the fire.